The move comes at a time where hospitals are increasingly challenged with expanding their service offerings while maintaining their primary focus on clinical care. Healthcare Ridesharing – What Does it Mean? An estimated 3.6 million Americans miss medical appointments due to a lack of reliable transportation. As a result, these patients — who commonly belong to vulnerable populations — are more likely to experience chronic disease exacerbations, unmet healthcare needs, and poorer medication adherence. The proposed door-to-door transportation services could thus act as an investment in preventative care. Removing transportation barriers from healthcare also has the potential to mitigate rising demand for virtual clinical care options like online appointments, telehealth, and mHealth. A hospital-endorsed ridesharing service creates an additional care touchpoint that can elevate patient convenience and loyalty. However, health systems will need to revisit their entry/exit procedures to ensure this new touchpoint doesn’t inadvertently disrupt on-site operational flow and/or care-giving processes. Healthcare providers successfully implement incremental changes and improvements within hospitals every day, wherein the environment is tightly controlled and easily monitored. In fact, this change is often so fluid that it’s invisible to the patient. 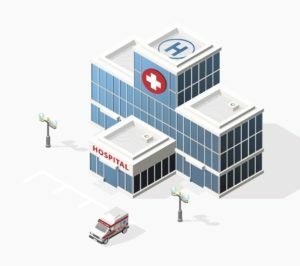 Conversely, on-site changes made outside of a hospital’s walls, including the adoption of ridesharing services, rarely embody the same finesse — but they can. Coined as the “Patient Transition Zone”The physical space in which a member of the public transitions into a patient (the entry experience) or a patient transitions into a member of the public (the exit experience) by Impark HEALTH’s specialists, this is the area in which patients and visitors establish a critical first and last impression of their overall care experience that ultimately influences HCAHPS and PX scores. “We recommend two things when introducing ridesharing to your Patient Transition Zone. First, allocate non-clinical support staff to the new entry method, like cross-trained valet attendants who can track ridesharing bookings, patient attendants who can help patients in and out of vehicles in a safe, controlled manner, and so on. The key to any hospital rideshare program’s success will be in the blueprints, according to Impark Vice President Rick Wilson: “If healthcare providers are serious about ridesharing services, it’s essential that they’re considered during hospital construction and redevelopment. Healthcare parking facilities are commonly filled to capacity, which can lead to congestion, bottlenecks and, crucially, missed clinical appointments. While hospital-endorsed ridesharing services do have the potential to marginally reduce parking demand, such demand will not disappear completely. Thus, success lies in the design and adoption of a multi-faceted transportation strategy; one that makes it as easy as possible to visit their medical facility for drivers and non-drivers alike. If parking has become a barrier for drivers receiving clinical care, this transportation strategy should include, but not be limited to, initiatives to increase on-campus parking capacity without construction. If implemented correctly, ridesharing can give healthcare providers an edge — particularly vital in a hyper-competitive marketplace that revolves around crafting patient loyalty and improving patient satisfaction. However, a successful ridesharing plan can only come to fruition with effective planning, management, and resources. That’s where Impark HEALTH can help. Impark HEALTH has operated in the healthcare vertical for over 30 years, interacting with an average of 15 million patients every year across the U.S. and Canada. Our goal is ambitiously simple: to improve patient experiences across North America through the holistic implementation and management of patient-first parking, transportation, and wayfinding solutions. From small rural hospitals to metropolitan healthcare giants, we’re dedicated to helping healthcare providers of all shapes and sizes pursue The Triple Aim on both a consultative and turnkey management basis. Get in touch today to see how we can help you. Want to learn more about improving patient loyalty through your parking lot? Sign up for our monthly emails for how-to guides and industry insights.